Christmas Pudding Ice Cream Pops were part of our Christmas get together menu on the weekend and one of the most requested recipes from the night. They taste incredibly festive and are made using only four ingredients. 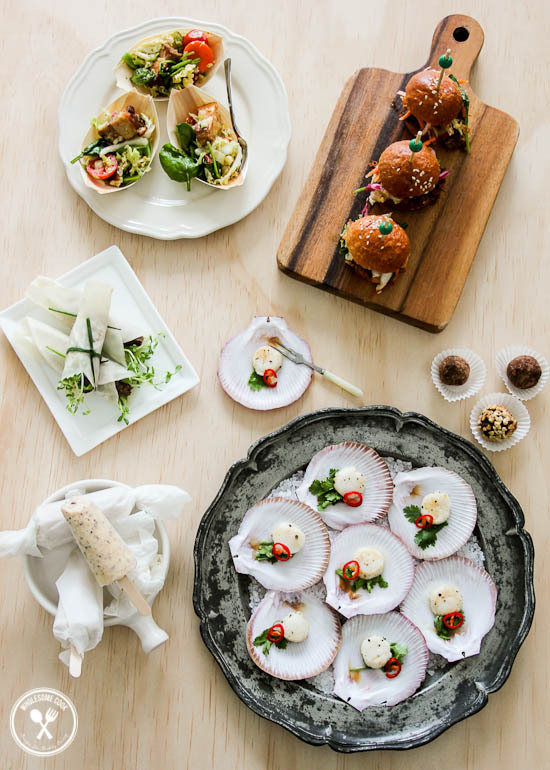 PLUS I share 12 recipes for a simple to do Christmas entertainer feast. All recipes will serve 12-14. It took about a week of brainstorming to come up with our Christmas get together menu last weekend, mainly because I wanted to be considerate of people attending. By the end of the evening I’d received more than a handful of recipe requests from the guests and since I love to share good ideas around, I thought, why not share these with you as well. 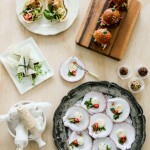 You’ll need 12 freshly shucked oysters (I used Coffin Bay oysters from South Australia). Place about 1/4 cup Brookfarm’s macadamia oil in the freezer about an hour ahead. For the dressing, mix together 1/4 cup finely diced mango, 1 tablespoon apple cider vinegar, 1 sprig coriander – stems only, finley chopped and 1 teaspoon finely chopped red long chilli. To serve, spoon about 2 teaspoons of the mango mixture over each oyster. Shave the frozen oil with a fork and place a little on each dressed oyster. Serve immediately. This is one of my favourite ways to serve scallops. 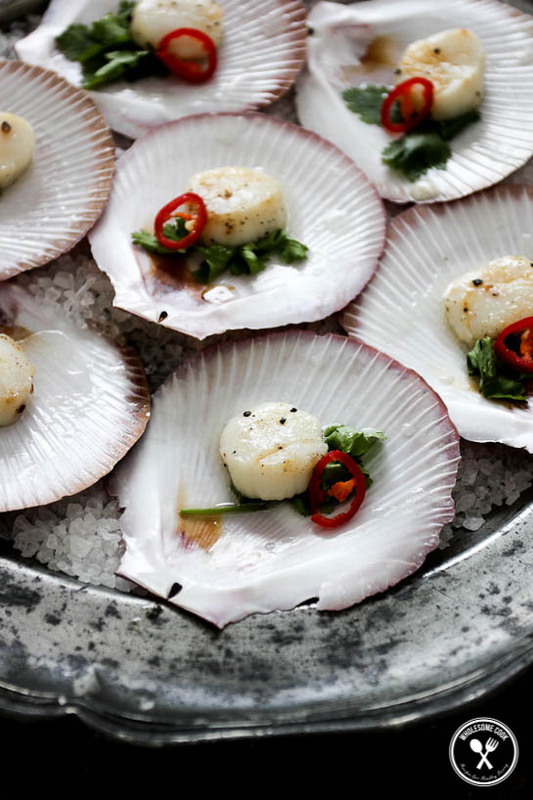 This Vodka and Lime Scallop recipe is perfect as a shared starter, looks very stylish and is a breeze to make. I actually ended up changing these up a little and made them into Cucumber Slushie Shooters. 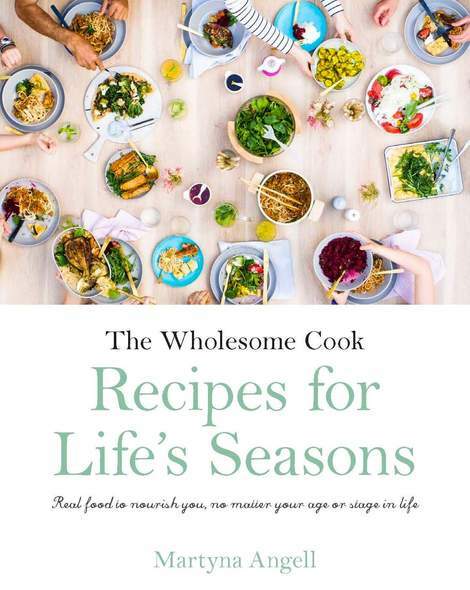 Using a power blender, blend together 2 cups ice, 2 Lebanese cucumbers – diced , 1 cup coconut water, 1 sprig of dill fronds only, a good grind of salt and 1/4 cup milk of choice. You could strain the cucumber puree and serve only the liquid in the form of consomme. Serve in tall shot glasses with a straw. This one was everyone’s favourite and I wish I had made more than one serve per person. I used this recipe for Thai Pumpkin Soup but instead of garlic croutons, I served the soup with Crispy Fried Onion (available from IKEA, how handy) and finely chopped coriander. I’ve mastered the Peking Duck at Home recipe a while back, but this time I wanted the prep to be a little more fuss-free, so I opted for more beef instead. To be honest, you could almost use rare roast beef in this recipe for an extreme shortcut version. For 24 pancakes, cook about 300g eye fillet steak to your liking and slice thinly. 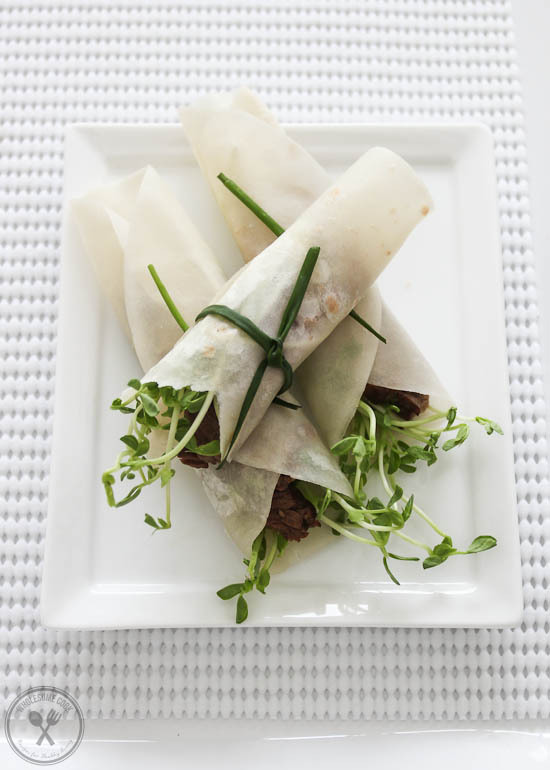 Layer a couple of strips of the beef on a mandarin pancake and top with a small handful of pea sprouts and a wedge of cucumber or raw zucchini. Serve with soy sauce or this Natvia sweetened bbq sauce. I chose organic eye fillet because it’s tender and I dry-aged it for 24 hours in the fridge beforehand. To do this, sprinkle a little rock salt (about a tablespoon per 200g of meat) on a platter. Cover with paper towel and place beef on top. Store uncovered in the fridge for upto 36 hours. For this particular recipe, cube the beef fillet first so that it can be dry aged more intensely and would be easy to skewer straight from dry-aging. Use about 3 pieces per skewer. Season with freshly ground pepper before frying or grilling for 20 seconds on each side. The Chimichurri My Way recipe was a no brainer to use with this and it was an all round favourite on the night. It seems that for most of the men in attendance, there was no simpler joy than a skewer of beef. 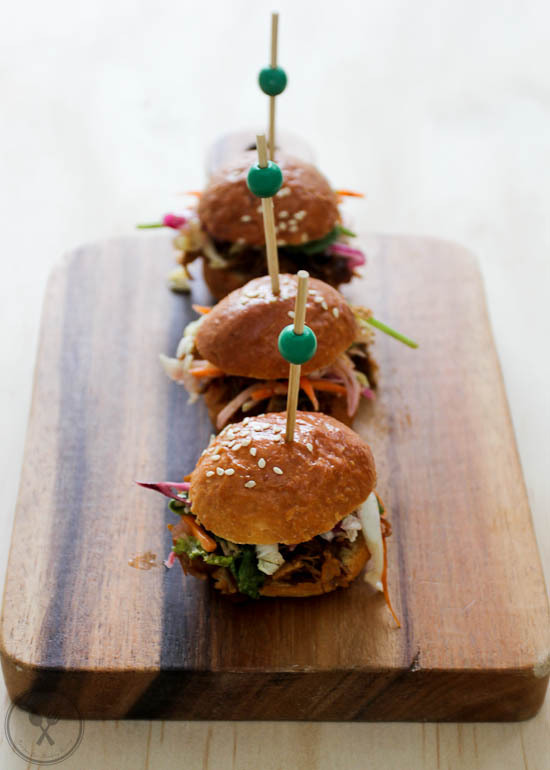 I used this 48 Hour Pulled Lamb Shoulder recipe and a variation of the slaw to make the sliders. Brasserie Bread’s brioche buns were perfect for this, but if you can’t get those, any small dinner rolls would do. Everyone’s favourite finger food, wouldn’t you agree? I based mine on this Healthy Baked Spring Rolls recipe but used larger sheets and combined barbecue chicken with cooked down shredded undressed coleslaw mix to make the filling. A dash of powdered ginger and five spice mix added some Asian flair to the dish. 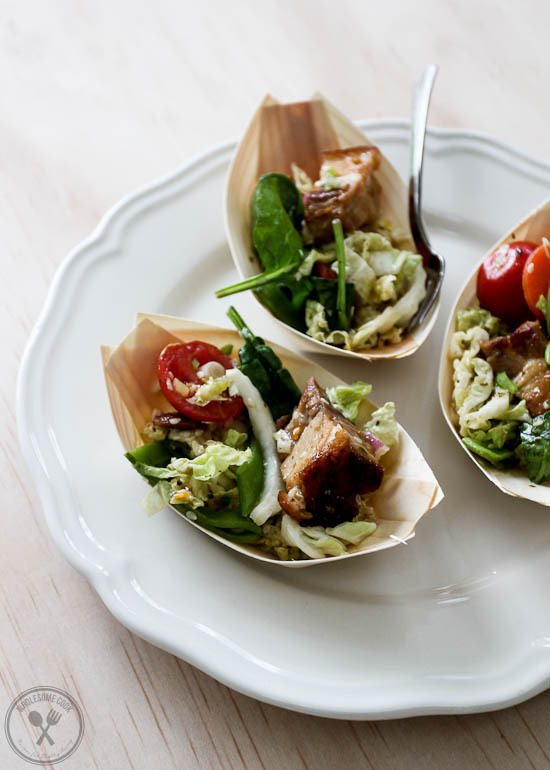 Inspired by the Chophouse signature salad, but without the scallops and caramelised pork is made using rice syrup. This will serve 4 as a main. Toss together 1 small wombok, 200g of cherry tomatoes cut in half, finely sliced carrot, 1/2 small red onion, handful of snow peas – sliced and a handful of baby spinach leaves. To make the dressing, mix together 2 tablespoons apple cider vinegar, 1 tsp fish sauce, 3 tablespoons rice syrup, 1 teaspoon sesame seeds and 1/4 cup light olive oil. Reheat a pressed cooked pork belly piece in the oven according to instructions – this takes around 20 minutes. Cut into bite-sized pieces and toss in a warm pan with 1/4 cup rice syrup until caramelised. Add into the salad and mix. Dress with the dressing and serve. I decided to omit them from the menu because in the mad rush that morning, I’d forgotten to buy some quark cheese for this 10 Minute Quark Donut recipe I was going to adapt from. However, the next day I thought I might as well try making them with regular cottage cheese and they worked! So, use the abovementioned recipe and substitute 1/2 teaspoon of lemon essence with 2 teaspoons rosewater. Luck had it I’d just finished developing and shooting a Christmas inspired range of recipes for Anathoth using their Traditional Fruit Mince. These are the folks whose jam, relishes and pickles I’ve loved long before I even dreamed of writing a food blog, let alone thought of developing recipes for. And oh my gosh, that Fruit Mince is no exception… It makes to die for Nut-Rolled or Cocoa Fruit Mince Ganache Truffles. And while the idea of serving the Fruit Mince Ice Cream Loaf has crossed my mind, I wanted to make the dessert a little more quirky and finger-foody as well. And so, having about half the loaf left in the freezer from shooting a few days before I decided to make what turned out to be the most sought-after, creamy and tasty ice cream pops. Dairy-free chocolate and milk can also be used in conjunction with dairy-free ice cream. Adapted from the Anathoth Fruit Mince Ice Cream Loaf recipe. Makes about 16 small or 12 medium sized ice pops. Place all ingredients into a high powered blender and process until smooth, about 40 seconds.Pour mixture into ice pop moulds and slide in a paddle pop stick. 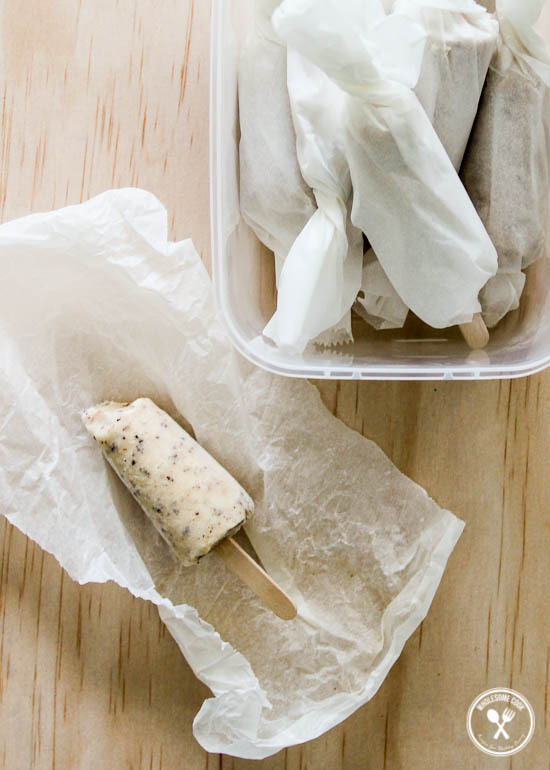 Remove ice pops from moulds and wrap each tightly in non-stick baking paper to help prevent freezer burn and odour transfer when storing. Store in the freezer for upto 1 month. Love the Christmas ice pops idea! So simple to make but I can already imagine they would be a hit at our place. Oh my! That menu sounds amazing. I love that you didn’t go with the standard seafood and incorporated a few other flavours. Must try the donuts and the ice pops sound amazing too! This is my way to enjoy fruit cake! I love this idea. Those scallops sounds great and I love the festive trim on them too! They look like little baubles of yumminess. Oh my gosh! I just made these ice pops and they are amazing!!! Definitely adding to our Christmas Day menu. Those oysters sound delicious. Will have to use them to convince my husband to try as he loves mango and macadamias. Lovely post. That is a super impressive menu!! Love it. I especially love the idea of Christmas Pudding popsicles! I’m going to agree with everyone and say those popsicles are such an amazing Australian Christmas recipe. I love the idea of using traditional Christmas flavours but making them more delicious and weather appropriate. What wasthe name of the low sugar ice cream? I didn’t even know that existed but it sounds like my dream. I try to keep my sugar intake low but I really want to make these..
hi haceyg, thanks for the comment! I just ate my last pop last night and will definitely be making more! The low sugar ice cream I used is Home Ice Cream (yup, that home delivery truck with a bell) as they contain alsmot half of the sugar of regular brands. The vanilla flavour comes in 2 litre tubs (product code 5). Just wow!!! Nothing to say, they all are amazing. Thanks for sharing the recipe with us.